In 1993 Kurt Cobain and William S. Burroughs released a rarely-discussed spoken word record entitled “The Priest, They Called Him.” Since I was a fan of both contributors, I eagerly purchased the album so I could complete a collection I was working towards. Bad idea; the album sucked. Live and learn. 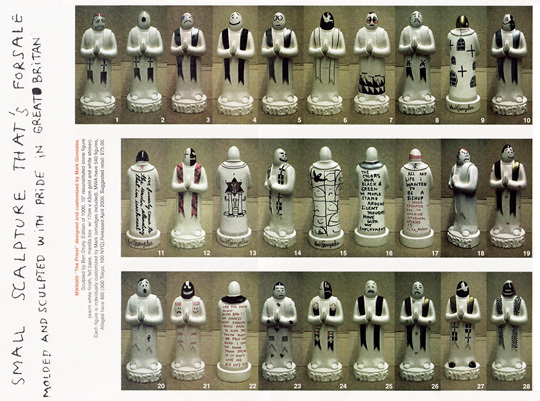 Around 6 years after this, and long before the concept of collaboration became commonplace [nearly to the point of obnoxiousness] Mo’Wax and Mark Gonzales released an edition of 1000 Priest statues made of reconstituted stone (porcelain?). The figure was actually sculpted by Ben Drury, not Gonz- but each one was customized by Mark with a paintbrush, sharpie, pencil, or a combination of these. If you’re a weathered skate nerd, you’ve likely seen images of them floating around the internet. I think Mo’Wax distributed around 500 of them directly within the UK, and the remainder went to retail in Tokyo, friends & family, various skate shops, and Alleged Gallery in New York. 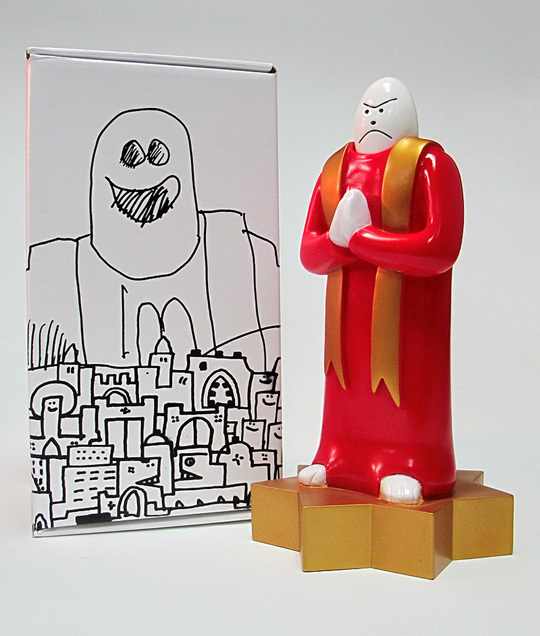 I have been searching for some of those remaining ceramic figures for years; so needless to say, I was elated when toy connoisseur Super7 said that they were releasing a brand new Priest figure in conjunction with Gonz and Krooked Skateboards. The Priest stands at approximately ten inches tall and is draped with a red robe, adorned with gold. You can even change the facial expression with a twist of his head. I’m especially glad that this thing is made of Japanese vinyl, because if I had acted upon my impulse and began the hunt to collect a range of the original stone versions from a decade ago, my children would have positively destroyed each and every one of them by now… But for anyone reading this, let me know if you’ve got any of the original reconstituted stone figurines, I will pay in gold bouillons or grocery money. To purchase Mark Gonzales’ The Priest, visit Super7store.com … and I suggest you hurry as it’s rumored they are nearly sold out already.